Players Pass now Players Pack! Good morning from a wet and rainy day at Rock Manor. I am here to announce that our Player's Pass that we have sold for the past 2 years has now been renamed to the Player's Pack. The package will remain the same with a slight twist in 2015. When purchasing the Players Pack you will receive 3 Anytime Rounds, $60 Worth of range balls and a new 2015 Delaware advantage card. The good news for you is that the Delaware advantage card will be valid at all 3 Billy Casper managed properties in Delaware. 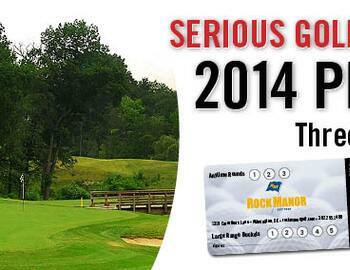 That means you will get $7 off each round when you play at Rock Manor, Ed Oliver or Delcastle. In addition to this great discount you will also be enrolled in our new rewards program. Each dollar that you spend on greens fees will equal 1 point. Here is the breakdown of the reward tiers. *Free rounds are valid M-F anytime, weekends and holidays after 12pm. No additonal fees. Let's hope for some better weather in the next couple weeks!